With the OCARINA concerts just around the corner, the teams behind this Legend of Zelda inspired musical performance, have been refining and making final touches ahead of their first performance this Friday 2 November in Sydney. Gamers Classified had a chance to speak with one of the groups behind Ocarina, Ensemble Françaix during their rehearsals. Ensemble Françaix tell us how they got involved with the Ocarina concerts, some of their first experiences with music , and how others can get involved in music. Check out the interview here. Plus, to receive a 13% discount on tickets to the OCARINA concerts, visit zeldalive.com and use the code GCOCAR. GC: I’m here with Matthew Kneale the bassoonist from the OCARINA concerts. Hi Matthew, how are you? Matthew: Very well thanks! How are you going? GC: I’m very well thank you. So, tell us how did you get involved with the OCARINA concerts? Matthew: I’m very lucky to be involved with these Ocarina concerts. I’m part of a group called Ensemble Français or Ensemble Françai’X’ – it’s very contentious on how that name is said. We chose to play this sort of music because we wanted to get in touch with the different side of the community, of the gaming community, that love to hear their music performed live because they always normally just hear it on their computer game. So, we thought it would be a wonderful idea to expose them to the concert hall and to see all the wonderful instruments that are on show – that produce this wonderful, wonderful music that’s been performed in the game. GC: Definitely. Can you tell us a bit about how you started playing the bassoon? Matthew: Sure! I started when I was five-years-old on the piano and in the Peninsula, where I lived in Melbourne, there were a lot of youth orchestras around at that time and there still are. Of course, all the youth orchestras have bassoons but they weren’t being used. 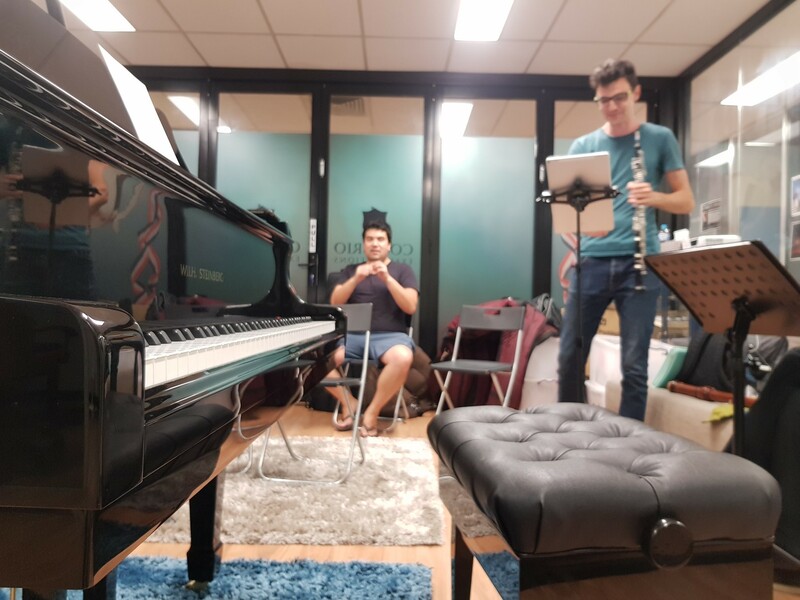 So, when the organisation saw me play piano they thought it would be a really great chance to get myself involved and exposed to the instrument and since the age of eleven, when I picked up the instrument, I’ve continued playing it and so here we are today in Sydney and I’m playing the bassoon in some of the most legendary music of computer games. GC: So, because the OCARINA concert celebrates the music from The Legend of Zelda, do you have a favourite Legend of Zelda game? Matthew: Well I would have said 12 months ago that the Ocarina of Time was my favourite game but now, since Breath of the Wilds has come out, I think it’s actually overtaken it. You know it’s sad for me to say that but what’s wonderful about both Zelda games and why I love it, is actually the storyline and then the storyline goes through with music and it combines and it makes this sort of atmosphere that creates this game and makes it really, really epic – hence why it’s had such a following. I believe it’s the 20th year if I’m correct or something like that? Matthew: Yeah, I think so or something, I think it’s something along those lines but it’s incredible that a legacy has been formed via this game and it’s really important that we pay tribute to it and I think as musicians it’s really important that we can show our musical virtuosity by playing this sort of music. GC: And speaking of live music if people wanted to attend one of the OCARINA concerts or see Ensemble Françaix live, how can they get that information? Matthew: Sure! So, follow us on our Facebook page which is under Ensemble Françaix or Françai’X’. We’ve got an email as well and website which is www.ensemblefrancaix.com and please subscribe to our email and newsletter things and I’m sure that you’ll be able to follow us on there. GC: Matthew Kneale, thank you very much for your time. Matthew: Thank you so much. GC: I’m here with Emmanuel, the oboist from Ensemble Françaix. Hi Emmanuel, how are you? Emmanuel: Very good, how are you? GC: I’m well thank you. So, can you tell us how Ensemble Françaix got started? Emmanuel: Well, Ensemble Françaix started as Matthew our bassoonist approached me and he said: “I’d like to be in an ensemble with you and I don’t want it to be too big. I want it to be a small ensemble and preferably just piano”. So, I said: “I’m living with one, I’m living with a piano player”. I grew up with Nick, learning at the Sydney Conservatorium of Music and then he moved down to ANAM, the Australian National Academy of Music and then the all three of us were in Melbourne at the same time. Nicholas and I were living together so we just started playing some music together and last year we actually did a concert of music of Final Fantasy VII and that went really well, so we decided to pick another amazing game to show the people that this is actually how the music is made. Those video game soundtracks, as you all know, are electronic so we’re gonna try and provide a classical, real spin to them but they’ll still have all of the good classic themes and all that. GC: So, how did you get started on the oboe? GC: And hopefully many more years in the future. So, because the OCARINA concerts do celebrate the music of video games can you tell us, obviously besides the Legend of Zelda, what other video games do you like to play? Emmanuel: Being a musician, I can’t go past Banjo Kazooie. It’s literally banjo…kazooie – they’re two musical instruments. The whole game is focused on music and it has a really strong connection with that. Other games that I really liked are like the Harry Potter Chamber of Secrets game, fantastic music in that too. Last year, our ensemble did the music of Final Fantasy VII, which I personally haven’t played but Nicholas has countless times – even though it’s a really big game from memory – but it’s got fantastic music. Actually, I was in the Melbourne Symphony Orchestra last month, playing the music of Final Fantasy VII…not just VII: VI, IX, and X. We did a symphonic concert of it and it packed out Hamer Hall in Melbourne, like a thousand people, two different concerts of it as well. So, there’s obviously people who want to see this live, produced live in real time. GC: Well congratulations and we’ll let you get back to rehearsing. Emmanuel – oboist, thank you very much of your time. GC: I’m here with pianist Nicholas Young. Hi Nicholas, how are you? Nicholas: Hi Yoshi, I’m very well thank you. GC: All right, so we’re backstage at the OCARINA rehearsals, how is that going? Nicholas: Yeah, well today’s the big rehearsal. It’s Wednesday night here. It’s really yaknow, it’s crunch time. Today’s the day we’ve got to get all the parts together, get all the instruments in-sync. This is the exciting part, to see you know whether the ideas are really gonna pull-off and whether the music will make sense and whether it’s fun. It should be a lot of fun, rehearsals come in good company usually – a really great process. Performing is fantastic as well but this is where it’s all materialising and taking place. GC: Definitely. So, if people did see this concert and you know, got inspired and wanted to learn how to play an instrument, do you have any advice on how they could do that? Nicholas: Yeah sure. Well here, we’ve been very generously lent this space by the Con Brio School of Music. They’re a fantastic school who really embrace people who want to play video game music, anime, things other than just traditional classical. They’re fantastic for teaching the traditional repertoire as well and the latest app YOUBRIO is also a wonderful way to begin uploading a few recordings, you know getting a bit of feedback, entering auditions and competitions. Something really special they’re doing at the moment, is opportunities to play with people like Animenz and Theishter and these very famous YouTube figures – people who are really making a difference in the musical lives of so many people. So, they’re a wonderful option in Sydney and I would love to have something like that down in Melbourne. GC: Hint, hint. We’ll let you get back to your rehearsals. Nicholas Young, thank you very much for your time. Nicholas: Thank you very much. You can also check out last month’s interview with Nicholas Young, where he talks more about the driving forces behind the Ocarina concerts, music apps, and the future of classical music. Gamers Classified was also able to speak with another group behind Ocarina – video game cover band, The Consouls. To know more about their experience covering video game music, click here. The Ocarina concerts will be held in both Sydney and Melbourne, over November and December. As another reminder, to receive a 13% discount on tickets to the OCARINA concerts, make sure to visit zeldalive.com and use the code GCOCAR.